I am 14 years Old and Love Swimming, 2009 Oil on canvas 126 x 160 cm. The range of the participating artists goes from the Dane Niels Bonde, who reflects the border between virtual and physical identity and physicalness. Fat is an existential and body-related material. There are lots of artists that worked with fat from Joseph Beuys to Teresa Margolles. The range that Society deals with fat – the “flavor-medium” goes from delight to disgust. The discourse ranges from lucullan stimulant to adipose that has to be liposucted. But in every case the discourse is strongly related to aesthetics. 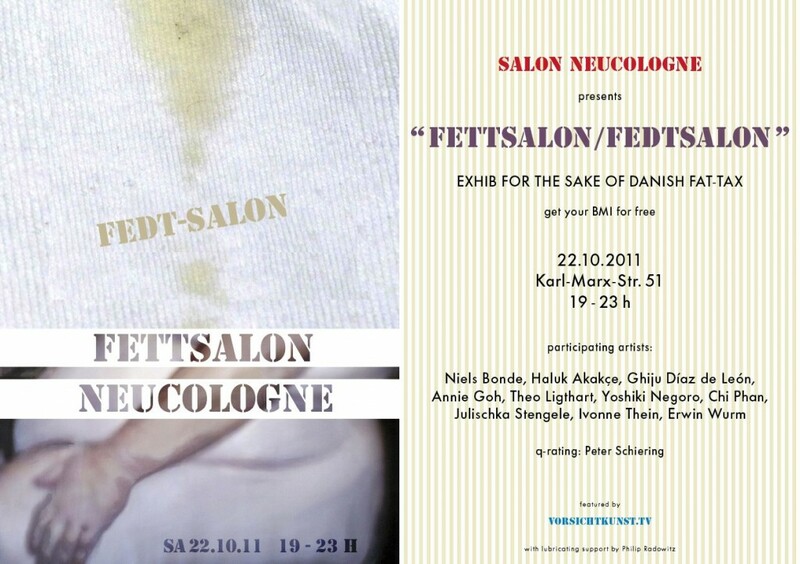 The “FETTSALON / FEDTSALON” on Oct. 22nd takes the Danish Fat-Tax as a starting point to confront new artistic statements. The governmental grasp to the consumption of fat in the name of “national health” is a novelty. Denmark is taking in best puritan tradition the role of a vanguardist for the rest of the world. This leads to deeper thoughts. The range of the participating artists goes from the Dane Niels Bonde, who reflects with his painting “I am 14 Years old and love swimming” the border between virtual and physical identity and physicalness, up to Erwin Wurm, whose drawing of a “fatcar” takes the motive of crapulance back to the world of goods. Julischka Stengele and Ivonne Thein both deal with the borders of the discourse about physical shape and its aesthetic effects. The Turkish artist Haluk Akakce narrates his personal effort to get out of a certain governmental control via eating. And the young soundartist Annie Goh traces the sound of fat. Theo Ligthart became well known for his artistic reflexion on the borders of consumption- and artworld. His pieces analyse the way that eating and self- enhancement are connected nowadays. Yoshiki Negoro, Chi Phan and Ghiju Díaz de León bring in further interpretations of the topic. Last but not least there will be the effort for an accessible live-performance that aims to transform cream to butter only with fatconsuming muscular strength.